Happy 2013! After things calm down after the holidays I tend to get really antsy to plant seeds but I still can't do that for another couple of months. My solution this year has been to plant bulbs inside (and impulse buy cheapo plants while I'm at the grocery store.) But for now let's focus on the bulbs. 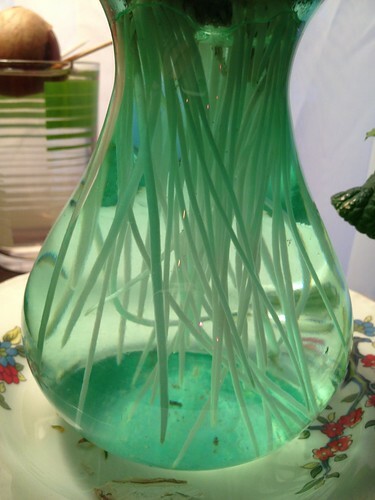 [caption id="" align="alignnone" width="375"] check out that sweet bulb vase[/caption] I don't even know what this bulb is. I think it's a hyacinth but who knows? My mother gave me this one a few months ago and for a while I just left it thinking I would plant it outside. But I forgot about it when I planted my bulbs outside so I decided to do it inside. This picture is from about a month ago, right after I had put it in the window that actually gets light. 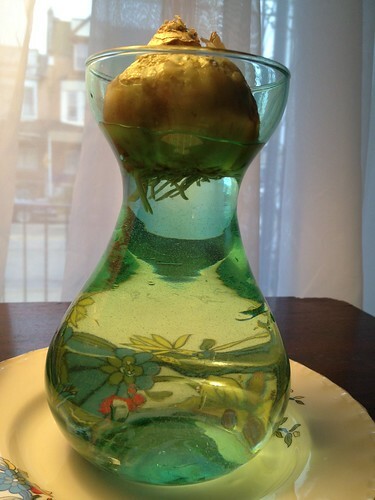 You can see I put too much water in it - the bulb itself shouldn't be sitting in water, just the little roots. I did that on purpose in case I forgot about it (which I did!) but it definitely started getting a little moldy around the parts of the bulb that were sitting in water. I got worried so I took it out and washed the vase and even washed off the bulb a little bit with some water and a dishcloth and it seemed to work out fine. Obviously the way to avoid this is to not let your bulbs sit in water. [caption id="" align="alignnone" width="375"] hello, small friend[/caption] Clearly the mold didn't deter it too much because here it is a month later. Now that I've gotten used to watering it (and remembering that it's there) I make sure to keep the water level below the bulb itself. It's not so hard now because check out the roots: [caption id="" align="alignnone" width="375"] christmas lights reflected in the glass because YES the tree is still up[/caption] These guys are pretty crazy! I like how they look through the glass. 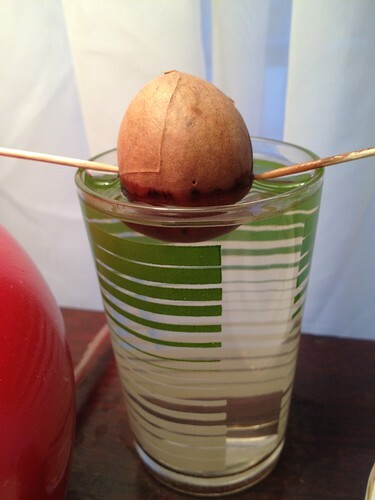 The other thing I do when I'm feeling like I don't have enough little plantlings to care for is Sarah's Yearly Attempt to Grow an Avocado. This year is no different! [caption id="" align="alignnone" width="375"] i believe in you, avocado[/caption] This is what happens with me and avocados: I love avocados. We eat a lot of avocados. And I've tried and tried to grow one like this and without fail I forget about it and it dries out or it gets too wet and is mushy and moldy and either way I end up with no avocado plant. I mention the eating of avocados not because I want to grow my own to eat - I've pretty much chalked that up to an impossibility in this climate - but because I am ALWAYS tempted by pits lying around and eventually I can't take it anymore and try this again. This time I did it a little more carefully: I washed and scrubbed the pit in water to make sure I got all the avocado off. Then I let it dry for 24 hours to make sure it was nice and dry. Then I put the toothpicks in at an angle so that more of the bottom would be submerged in water. AND I have been changing the water in hopes of discouraging mold growth. But you can still see in the above picture that there is some weird dark stuff going on around the water line so I may take it out, change the water, and scrub the pit itself a little. I fully believe that this would be easier if I just planted the pit in some soil in a pot but I have a weird (okay, not weird just proprietary) stubbornness and I want to grow it this way! I remember doing it as a kid, I remember my friend's mother doing it and I KNOW IT CAN BE DONE. The nice thing about this, though, is that it's completely free and I can try it again if this attempt doesn't work. But come on, people. It's time. 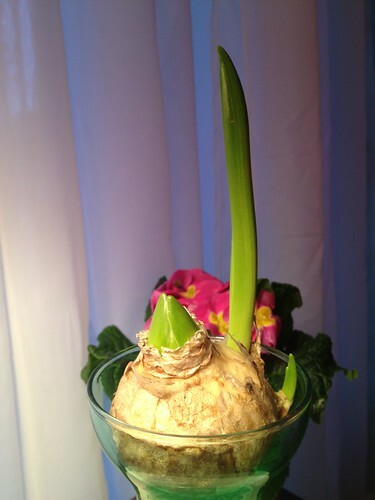 Do you grow bulbs indoors? I always thought it was kind of silly but then my mystery bulb started growing and I got that sense of accomplishment mixed with pride that comes with watching something thrive under my (minimal) care - the same feeling I get from watching my plants grow in the summer. It's good to feel that again! And it's a good reminder that spring will come no matter how long winter feels.